Melissa S. Kelly-McCabe, Executive Coach, and President Clear Intent Strategy, Inc. 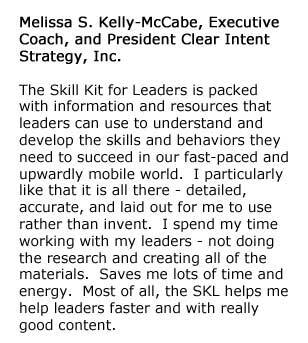 The Skill Kit for Leaders is packed with information and resources that leaders can use to understand and develop the skills and behaviors they need to succeed in our fast-paced and upwardly mobile world. I particularly like that it is all there – detailed, accurate, and laid out for me to use rather than invent. I spend my time working with my leaders – not doing the research and creating all of the materials. Saves me lots of time and energy. Most of all, the SKL helps me help leaders faster and with really good content.